Be the first to share your favorite memory, photo or story of Derinda. This memorial page is dedicated for family, friends and future generations to celebrate the life of their loved one. 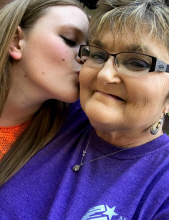 Derinda Kay Hannsz, 60, of Haskell, passed away Saturday, February 2, 2019 in Haskell. A graveside service will be held 10:00am, Tuesday, February 5, 2019 at Willow Cemetery with Pastor Ollie Pierson officiating. A visitation will be held Monday, February 4, 2019 at Haskell Funeral Home, 2 Avenue D, Haskell. Condolences may be made at www.haskellfuneralhometx.com. Derinda was born August 20, 1958, in Haskell, Texas, the daughter of Roy Amonett and Omitene Strickland Amonett. On January 15, 2000, she married Keith Hannsz. She worked as a finance manager at multiple businesses in Haskell, Stamford and Sweetwater. Derinda was co-owner of K & D Marine repair, along with her husband Keith. Her favorite pass-time was being with her family, surrounded by those she loved, and who loved her. She was very active and present in her children’s lives, helping with various committees and being their number one spectator at their events. Derinda was a member of Cornerstone Fellowship Baptist Church. Derinda is survived by her husband Keith Hannsz of Haskell; daughter, Felicity Hannsz of San Angelo; son, Jeremy Gentry and wife Nicole of Abilene; grandchildren, Elizabeth Gentry, Gabriel Banks, Evan Banks all of Abilene; numerous aunts, uncles, cousins and a host of dear friends. To send flowers or a remembrance gift to the family of Derinda Kay Hannsz, please visit our Tribute Store. "Email Address" would like to share the life celebration of Derinda Kay Hannsz. Click on the "link" to go to share a favorite memory or leave a condolence message for the family.